An intrepid band of climbers traveled to the Cascades for adventure on Mt. Hood and St. Helens. Participants included your fearless leader and scribe, David Harris, Bob Suzuki, Tom LaWer, Steve Rodrigues, Rich Leiker, Mark Willey, Suzanne Remien, Keith Barnes, Steve Eckert, Mike Fleming, and Phil Fortier, making the largest number of climbers under 30 years of age I've seen on a PCS climb (with no offense to old farts like Rich, Bob, and Steve). Obtaining information on Mt. Hood is surprisingly difficult. The Summit Guide to the Cascade Volcanoes has a good overview of routes. However, the Mt. Hood Ranger Station is 20 miles from the mountain and has no information on snow conditions on the mountain. The guide service at Timberline Lodge wouldn't return my phone calls. Some useful info, including the SNOphone number, is at Timberline Lodge. Snow cat rental information is at 503-622-0701 and cats leave from the Wy'East Day Lodge hourly from about 2am to 6am. A cat can carry about 10 people with day gear. The trip was originally intended as a beginner's climb of Hood. The weather forcast had been iffy, so we decided to hire a snow cat for an hour ($90) to drive us to the top of the ski resort, cutting off 2000 feet of trudging up the slope under the lifts with uncertain conditions. The cat only had space for ten climbers. Fortunately, Keith wanted to be a purist and decided to hike up by himself two hours earlier and meet us at the top of the lift, earning the "Real Man (tm)" award! After a 2-hour weather delay at SFO, most of the party collected at the Portland airport and drove to the Timberline Lodge on Hood by midnight. Just as we started to set up tents, sprinkles began, then turned to hard rain. All of us managed to sleep through our 4:45 alarms (!) until Bob fortunately woke us at 5:15. We rushed to dismantle camp and meet the rest of the team, which had arrived separately, in time for the 6:00 snow cat; amazingly we all made it! Normally it is wise to start Hood very early and be off the steep portion soon after sunrise. This time almost all of the climbers who had left earlier had turned around on account of rain, snow, and whiteout conditions. We followed tracks of the hardy few upward as the weather steadily improved, first giving us glimpses of magnificent cliffs, then gradually clearing until the entire upper portion of the mountain, decorated with rime ice, fumeroles, and a gaping bergschrund, was laid out before us. We took out crampons and ice axes on the Hogback ridge just below the bergschrund. The snow was crusty on top but not fully consolidated below; no great skill with an axe would have been necessary for an arrest. A snow bridge spanned the 'schrund near the right side and we all crossed with little difficulty, gaining the 30-40 degree slopes above. The climb was just right for an introduction to snow mountaineering, steep enough to be interesting, yet not unreasonably difficult for a first time climber. Cloud cover kept the snow from becoming too mushy and dangerous. We cleared the steep slopes and gained the summit ridge and were surprised to find ourself instantly on the peak without any false summits along the way. The view was terrific, with Adams and St. Helens, Jefferson and the Three Sisters poking above the clouds which filled the valleys below. The temperature was 20-25 degrees, perfect for climbing, and only moderate winds drove us back down. The climb had taken less then three hours from the snow cat. The crust and soft snow were suboptimal for a fast descent, but we all returned to the cars by about 1pm. We'd encountered Dee, Arun, and Scott from the PCS on the mountain and hoped to meet them for lunch, but apparently missed them in the parking lot. With an extra day on hour hands, we drove over to Mt. 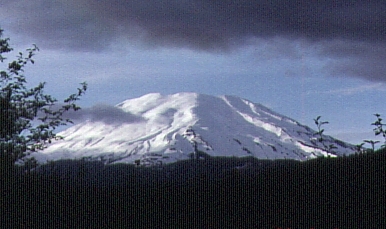 St. Helens, which involves returning to Portland and driving another hour northeast along highway 503. We stopped at the climbing registration at Jack's Restaurant 5 miles before Cougar. The forest service has quite a racket going, charging $15 per person for permits. Even for that fee, the roads were not plowed above the 3000' snow line, so we found St. Helens would involve a 3 mile trudge up a slushy road to "Climber's Bivouac" before we even reached the mountain and 5000' of elevation gain in the snow; it would be a much longer day than we'd anticipated. We parked at the end of the road to Climber's Bivouac and got to sleep before sunset. Keith, Mark, and Eckert began hiking at 4:15am to catch the sunrise from higher up, while the rest of us got some extra sleep for a 5am departure. Walking up the low-angle road, sliding on every step, was thoroughly demoralizing despite the ferocious pace Bob set. The early team missed a turnoff to the trailhead at the outhouses and ended up forcing a cross-country route. The rest of us took the two-mile slushy trail through the woods to treeline at about 4000'. We were worried about time, because it had been a long tiring approach and we needed to return to the cars by 3pm to get one of the climbers back to Portland for an early flight. Fortunately, the climb became much more enjoyable on the mountain proper. A fast team of about 15 from the Mazamas mountaineering club were keeping just in front of us and we took advantage of the excellent steps they kicked up the mountain. Clouds had been rising below us as we climbed and settled from above onto the top of the mountain until we lost most visibility; then the march became a 3 hour stairmaster exercise at about 1400' / hour. Despite having climbed in many groups of 2-3, we all found each other in the fog on the crater rim. Unfortunately we never got a view into the crater, but we did hear a huge avalanche roaring down the steep crater wall for nearly a minute. Ice axes and crampons were never necessary, though they might be desirable under more icy conditions. The descent became an immediate problem as the party glissaded down the slope into the fog and lost sight of each other. Fortunately there were hundreds of tracks on the mountain and we could follow footsteps back despite 100' visibility. Eckert used his GPS to locate where he'd cached his skiis and we met again on the trail when one part of the party heard the voices of the other part. We continued down the trail and back to the cars at a rapid pace, beating all odds to get back by 3pm. It had been a strenuous but enjoyable hike and a good way to begin spring conditioning. The most difficult part of the trip proved to be getting out of the parking area. Our van had been hemmed in such that it could not turn around, so we had to back out for 100'. The ground had patches of snow and there was so little clearance between us and the cars on both sides that we had to turn the mirrors of all the cars inward! Overall, this Cascades trip was a terrific adventure. Mt. Hood is a good beginning snow climb, featuring a bergschrund but overall easier climbing and much less elevation gain than the avalanche gulch route on Shasta. With the help of the snow cat, it can be climbed under fairly adverse conditions. St. Helens is more of a climb than we'd anticipated, given the 15 mile round trip on snow and the 5000' of elevation gain. We were very happy that everyone made the crater rim and got down safely. > Obtaining information on Mt. Hood is suprisingly difficult. These guys go up there all the time and are a great resource also. Portland Mountain Rescue has the latest photos of Mt Hood's routes and a lot of other related links. While this might seem overkill, we rented a Mountain Locater Unit (MLU) from the Mt Hood Inn in Government Camp for 5$. It is a small battery-pack like device that is on a sling that goes over the shoulder. It has a spring loaded switch attached to a toggle that you yank out if you are lost in a white out. It sends signals to some transponders on the mountain that relay it down to people below who are listening in (there was a receiver at the Mt Hood Inn too) and can come and rescue you. > and meet us at the top of the lift, earning the "Real Man (tm)" award! We should get that award too :-)! We started out at 3am from Timberline and it was wet, cold and occasionally snowing. > but apparently missed them in the parking lot. Thank you for waiting for us. Due to the lack of sleep and the rope and rescue gear that we each were hauling up, we took a long time to summit, as I recollect, we were past the Pearly Gates and about 10 mins away from the summit when we ran into you coming down. Our summit views weren't as spectacular as the clouds had come in over Rainier and Adams. The Mazamas routinely take beginners up Mt Hood, during the month of May, up the "easy" Hogsback route. Typically 3 or 4 per rope, several parties going up the chute at once, many more freezing waiting in line for their turn. The greatest objective danger is hypothermia in the line, statistically speaking. Our beginners were not on rope. They did not have harnesses, and we did not have any pro. Harris brought a half rope (7 or 8mm I think) but we had no way to anchor it as far as I know. Roped is different than on your own, but no safer unless pro is used. 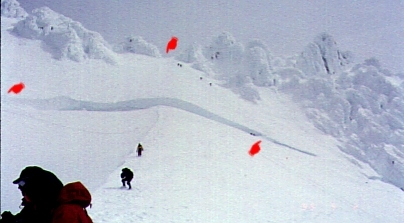 Remember the incident about 10 years ago where one fall wiped 21 people off Mt Hood? It was the top guy, and he knocked down several rope teams. That's the sort of thing I was thinking about when I mentioned the vertical climb right of the bergschrund being more dangerous than going to the left. There was also the Ptarmigan Peak accident in Alaska last year where an entire climbing class went to the hospital (and 2 to the morgue) because they were roped but not setting pro. Again, the top guy fell and wiped several teams off the face. Search the archives of this list for "Ptarmigan" and you'll get the full report. "Roped is different than on your own, but no safer unless pro is used." This statement challenges a standard mountaineering technique used for many years. It is standard practice for mountaineers to rope together in groups of two or three when ascending steep snow or when crossing glaciers. If one member of the group falls the other members can stop the falling person by using their ice axes. Sometimes this does not work and people have died, as previously stated, but many other times it has worked and people have been saved from almost certain death. So, I think roped is certainly safer than being on your own when crossing glaciers or ascending steep snow. I'm writing this as a warning to novices, who may get the idea that Hood is just a walk-up. It is not. People die there every year. Please be prepared! (I previously sent these comments to Harris, but they didn't make the report.) I'll send Aaron a few pictures of the slope to include in the website. I have personally watched several people go into uncontrolled slides on lesser slopes. The first one broke two bones and we had to evacuate in an all-day effort, the second one lost a bunch of gear and picked up some dandy bruises but escaped basically OK. The second one had an ice axe and got into arrest position, but not fast enough and the pick did not grab in the snow. It would take only a few seconds to get up enough speed to be unable to stop on the Hood crux. If you don't stop and you don't tumble, you come to an abrupt halt in the bergschrund (looks like a crevasse, but formed differently). > no great skill with an axe would have been necessary for an arrest. I must respectfully disagree. It's a 35 degree slope above the 'schrund, and icy in places. I did not use crampons, but did have to kick up to three times with plastic boots to make a good step. Using crampons may have given a false sense of how easy the footing was. Slipping above the 'schrund would have caused you to pick up speed VERY fast, so an instant arrest would have been easy... but any delay would have meant a fall into the gap and/or tumbling injuries. > crossed with little difficulty, gaining the 30-40 degree slopes above. Keith and I chose to detour around the 'schrund on the left, feeling it was safer than climbing several hundred feet in a straight line. Anyone falling above you after crossing the snow bridge would bowl you right into the gap. I don't feel it's ever safe to climb in a vertical line with close spacing. There were two large groups ahead of us, one went left and one went straight up. > a first time climber. I would not encourage beginners to summit this peak. Again, I must point to the danger of slow or missing self arrest reflexes. A slip was unlikely under the conditions we had, but I talked to a lodge employee who had been there several days earlier (without the cloud cover) and he indicated that stepping outside the tracks would launch a slush avalanche in which you probably could not arrest. In the conditions we had, a slip could have been stopped if the arrest was done properly and promptly. Any delay (with the corresponding buildup of speed) would have made it very hard to do at all. The surface snow was not solid enough for the pick to grab securely in a standard arrest position, but your crampons would likely have caught in the crust flipping you over backwards (assuming you didn't have the skills and reflexes to keep your feet out of the snow). > charging $15 per person for permits. And they issued 400 permits for the day we were there! Free for low-altitude tourist stuff, permits only required for going above 4800' on an 8300' peak. Climbers are apparently being used to subsidize the motorhome-and-suitcase crowd (who pay nothing at all). > we all found each other in the fog on the crater rim. > the slope into the fog and lost sight of each other. Some of us headed west along the rim to find the high point before the others got to the top, and the others apparently went down before we returned. I did not see everyone, so they must not have seen me! We were lucky that no one followed the wrong set of tracks down, because visibility dropped to less than 100' on the descent. We all finally bumped into each other in the trees about 3000' below the summit. More of a happy accident than a plan, but it worked! In the 2 years that I've been participating in this list...this topic has come up quite frequently. And every time it comes up there are always those that cite tradition or common practices or any number of reasons (and/or excuses) for doing this. Arun made a very good point to me a while back in a private note. I can't quite remember what it is but it still wasn't a valid reason IMO to be a member of a suicide pact. I've been climbing since i was 5 (22 now) and nobody has ever shared with me any evidence of when such an arrangement actually saved lives, except when moving near crevasses on a glacier. I've never heard anybody defend this practice on snow or on a glacier without crevasses AND give me supportive evidence. Why is that? ... being on a roped team without protection is more dangerous than being unroped, in many (if not most) situations. If you disagree, please share some evidence, anecdotal or otherwise, that would change my opinion. > two or three when ascending steep snow or when crossing glaciers. "Mountaineering, the Freedom of the Hills" says "A belayer should not tie himself to the rope, for once a climber has been engulfed in a wet, heavy avalanche, his belayer might as well try to snub an express train, and risks being snatched into the slide himself." The main reason people climb early in the day on Hood is because of wet snow in the morning sun. The rangers warn of cornices and avalanches, and those dangers were listed as high when we were there. We did not start early. The same book speaks of a "team arrest", giving it one paragraph out of 478 pages, but this technique is usually reserved for crevasses (especially hidden ones) and not for snow too steep to arrest on your own. The team can save you if they have margin. On a steep slope, however, where you can barely arrest yourself, having someone pull you over backwards puts you in the awkward position of having to arrest yourself FIRST, and THEN try to arrest them, all with an accelerating load pulling the rope away from you. Have you tried an arrest with a loaded rope below you? It's different. The bergschrund on Hood is right below the steep crux. I can arrest myself on the 30-40 degree slope above it, and in fact glissaded down it while others faced the slope and walked down in crampons, but doubt that I could hold someone else while I try to stop myself. Remember you will most likely be yanked off your feet, and will not be starting the arrest in a good position. Until you've tried to hold a backwards yank on 35 degree slopes with crust on top but softer snow underneath, don't tell me it's safer than walking alone. I've tried it, and I was surprised at the difference snow conditions made. Hard snow is easier to deal with because the axe pick holds. Soft snow helps everyone stop on their own (making the rope a psychological benefit only). Crust helps you get up speed, and tends to make you flip when you break through it - standard arrest positions will not work. Remember the route on Hood gives you very little distance in which to stop. When you are practicing, be sure to do it within 50 feet (or assign yourself two demerits for falling into the schrund). Don't get me wrong - I think there ARE places to rope up without setting pro. I've done it a number of times, most frequently to help a novice when I was sure I could hold the fall. I'm not sure I could have held a fall on Hood, under the conditions we had, and that route/conditions combo was what my advice was aimed at. I agree with Pat I. and SRE that climbers should be skeptical of the safety value of roping up on steep snow slopes without placing protection. Still there are times when it may be helpful--but the decision requires careful evaluation of the snow conditions and the skills of the party (ability to arrest, etc.). Two anecdotes come to mind: I remember Bill Isherwood telling me a story about how he saved a rope team from an uncontrolled slide by quickly applying a boot axe belay before the rope became taut on his harness.If memory serves me correctly, he already had a bite of rope around his axe as he was traveling and therefore got the belay in within seconds. The other situation was when I helped an exhausted beginner climber down the Hotlum-Bolam ridge on Shasta in icy conditions. Yes, in retrospect, we probably shouldn't have had him up there--but there we were at 12,000 feet with a friend who was in danger of stumbling over his crampons. I felt responsible for his safety and also felt that I could arrest for the both of us if he slipped. The two of us descended, the beginner going first on the rope. I went last and kept only a few feet of slack in the rope. Sure enough, he stumbled and began to slide. I prepared to arrest, but surprisingly didn't have to: his body weight didn't jerk me much and I held it upright with my crampons digging into the snow. This happened two more times before we made it down to safety. Three friends and I used a 150 foot piece of goldline on the Ingraham glacier route on Rainier about 20 years ago when none of us knew any better...it saved the last guy on the rope on the way down who fell through a collapsed snow bridge. I think he was glad to have the rope (he said he could see clear to China...) and the three of us held him easilly. The slope was not severe. I as well agree with Pat I., SRE and Butch that climbers should be somewhat skeptical of the use of roping up without having protection in place. Two situations come to mind- one being in class at ASI - 2 on a rope - and we learned to use rope with pro and that was the recomended way UNLESS you are in crevass area- then 3 on a rope well spread out was recommended. Also we practiced a running belay with 3 people on Shasta-1st person set a screw, thread rope; last person picked it out- went pretty fast when you got the hang of it. Next- just a few months during ago a seemingly safe snow climb of only 30-40 degrees heading toward Donahue Pass the snow collapsed on me and I was in a 10 foot deep "crevass". It was actually a drifted over hollow- but it was enuf to break a snow shoe rivit and thankfully nothing else got broken as I tried to arrest myself falling STRAIGHT down. (It does not work well- too much of a real-tough vector ) So after shaking myself off we continued up..still feeling safe- however- on the way down we roped and did a modified boot axe type of pro and alternated pitches as we climbed down thru and beyond the suspect area. On the way down my partner fell in as it extended to the side more than we thought- but it was getting filled in with snow so it was not so deep- BUT we were on the rope together, I had a solid bomb-proof belay on him and when he went it there was NO DOUBT I could hold his fall if it was deeper than it was. I vote for "no doubts" any day! (NOTE: as I set each piece of pro it was thoroughly tested with a couple of body-weights yanks). In retrospect, it was pretty scary but upon investigation not a compelling area to rope up in. However, the incident happened and was a little sobering- my partner would NOT have been able to arrest me when I had fallen in- nor I him- if we were roped- it was too steep and too sudden. See SRE's post- the decision to rope is also very contextual and certainly IMO not an hard and fast rule. At this point I was glad we were UNROPED!!! -- as if I had not been able to climb out myself or had a serious injury he would have been alive and up there to pull me out/render aid/go for help/etc. That is a major consideration to not roping up. The fianl analysis in my opinion is that one should practice -SELF-ARREST until it comes almost automatically- I have found about a hour is all I can take of jumping down the side of a (safe runout) mountainside and practicing arresting from my back, either side and frontways- before I am either totally 1- bored, 2-soaked 3- sore and/or 4- alas somewhat comfortable with my reflex to arrest. I haven't been following this thread from the begining so I'm not sure which route on Hood is being discussed but if there was 35-40 degree snow with a schrund under it then it sounds like the standard route. I did this with three friends two years ago. We started the climb at 6AM because one of the team members had the attitude that I quote, " I'd rather get hit in the head by a rock than start before 6AM!!". Well needless to say we passed on the direct route which was a regular projectile chute by 9AM when we go to it. Instead we went left onto the open 35-40 degree snowfield. The schrund was below us the whole way up making sure that we minded our steps. I agree with Steve that this was absolutely not the place to tie in together (if the rope was not first anchored). It would seem pretty difficult if not impossible to halt a slide into the schrund with three people on a rope. Ropes are great when traverssing glaciers where the possibility of punching through a crevass are very real. On steep snow it seems that the only time a rope is useful is when anchored. I climbed Hood last year in May under good conditions. We started around midnight, which was nice under a full moon. The snow was ideal in the night and early morning, firm but not too hard. By late morning the snow was mushy below the bergschrund. The slope is gentle all the way to the bergschrund, which is a couple hundred feet or so from the top. The bergschrund was the only spot where I had to be careful, lest I fall in and embarrass myself. I don't think a fall into it on that day would have resulted in injury (of course conditions vary and the crevasse can be dangerous). 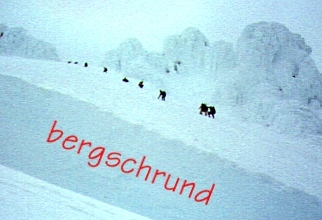 Steve Eckert mentioned the fumaroles below the bergschrund in his email. I think the worst that could have happened to me was a fall into a fumarole, which was possible had I tumbled and not quickly arrested on the steeper slope just below the top. A few people roped up prior to the bergschrund and a woman climbed the steep slope above it on hands and knees, but most of us did it unroped with crampons and an ice ax. More than two hundred people summitted on that fine day in May 1997. > 100 yards through jagged rocks and icy snow. > no time to react. Still think climbing roped is always safer? Sometimes yes, sometimes no. Those who tell me to tie in rather than clipping in will never convince me THAT'S always safer, either! The two who escaped probably clipped off and ran. Not good form, but good sense. The general feeling on being roped up is that on glaciers or in and around cravasses you rope up. With cravasses you need at least three people on cravasses. Try arresting a fall, setting up a zee/cee pulley by yourself and you will see why. It is almost impossible to get someone out of a crevasse by yourself. If the person who fell can not prussic out and has gear you will probably not be able to get them out in time. As for roping up on climbs, if you need to be roped up then you need to be setting anchors. You are not going to stop someone on hard snow at about 30 deg or more. If the snow is soft then you do not need the rope anyway. If it is hard and fast and steep then a rope is only going to get two or more of you in trouble.